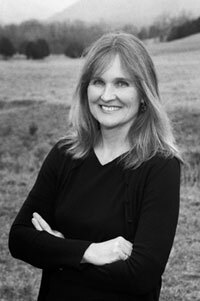 I am so glad to welcome back author Laura Brodie to Book Club Exchange! I have enjoyed all of Ms. Brodie's books that I've read -- THE WIDOW'S SEASON (my review), LOVE IN A TIME OF HOMESCHOOLING: A MOTHER AND DAUGHTER'S UNCOMMON YEAR (my review), and most recently ALL THE TRUTH (my review); and I am grateful that she has again written a fabulous guest post for Book Club Exchange! I love talking with book clubs.Whether meeting them in person, skyping, or getting acquainted during a conference call, few things are more fun than chatting about books over a glass of wine. So when my own book club chose my latest novel for our recent meeting, I was pleased. The event was bound to be a success since our host that month, Carol, has a beautiful home. Carol has transformed hundreds of acres in our corner of southwest Virginia into a Buddhist retreat, including a meditation center, a shining gold and white stupa, and a modern, secluded house made of stone and wood in an Asian-American style. The house is full of guest rooms where Carol hosts Tibetan monks, and in the back, a vast stone patio surrounded by butterfly bushes and hydrangeas leads to a swimming pool with misty views of the Blue Ridge Mountains. Book club at Carol’s means the evening will be divided between swimming in the lit pool and discussing books by torchlight. This is not our usual book club routine. Most of our members have modest homes, and the best we can do to encourage book club attendance is to bake some especially tasty brownies. Twenty-two names fill our email list, but an average meeting might entice nine women to come. And so it was a surprise when twenty women arrived at Carol’s house—like a family reunion with distant cousins who hadn’t surfaced in years. “What a great turnout for your book,” Carol said as I helped her move extra chairs onto the patio. "I think they’ve come for your pool,” I replied. “Are you nervous?” one of the other women asked. “Why should I be nervous?" The question seemed strange. I’d known these women for almost eighteen years, and many of them had already gushed to me about how much they enjoyed my novel. But as I tell all bookclubs, there is no need for everyone in a group to like what I’ve written. As an English professor, I know that the best discussions come when some readers are disgruntled, puzzled, or doubtful. Although open hostility isn’t helpful, most writers want to learn from their readers—to hear what worked and what didn’t. Any nerves I might have felt that evening did not come from fear of criticism. In my small town of eight thousand people I occasionally hear laughing concerns that I’m going to reveal some terrible secrets--especially since word has spread that my latest work-in-progress deals with multiple cases of adultery. My mother-in-law gave me a T-shirt that says “Careful or You’ll End up in my Novel.” I don’t wear it in public. Still, the real question is never how much I am going to reveal about others, but whether I have revealed too much about myself. “Novels are fiction,” I stress to my friends and family; nevertheless, the feelings within them often come straight from a writer’s life. My novels feature heroines who are usually English professors, like me, and these women’s attitudes, if not their experiences, often overlap with my own. My novels offer a glimpse into my soul, which means that book club can resemble therapy, with me on the couch. My latest novel, All the Truth, is about the aftermath of a violent confrontation between a professor and some students. And so my book club asked: Do I feel threatened by my students? Am I frustrated teaching them? “No, no,” I answered. “Really.” Every teacher has her moments when she’d like to strangle a pupil, but my students at Washington and Lee University tend to be bright, respectful, and pleasant. I do, however, live an hour from Virginia Tech, where memories of the 2007 massacre remain painful, and I have attended sessions at Washington and Lee on how to identify students who might be a danger to themselves or others. All of this experience lies behind my book, as well as my awareness of how the current, ultra-competitive nature of American education produces tensions and outbursts, and makes the teacher-student relationship more confrontational than ever. A professor at Washington and Lee once told me that after giving a young man in her class a C, she wondered if he would come to her house and harass her. Another professor at a college in Maryland explained how a student, furious about his grade, came to her office, pounded on her desk and screamed at her. I have never suffered such abuse. But as a mother of three teenage daughters I have witnessed other scenes of anger, tears, and frustration. Mother-daughter relationships lie at the center of All the Truth, and the novel features a fifteen-year-old whose voice comes from my years of experience listening to the edgy comments of teenage girls. And so, sharing your novel with your own book club means sharing personal aspects of yourself and your family. But the best book clubs do that already—they are places for companionship and mutual growth, as well as reading. The best I can hope is that when my book club sees glimpses of our shared world in my novels, they will recognize the compassion that I have for the characters in that world, and when they see pieces of myself, they will accept that flawed and struggling human being as a friend. A huge thanks to Ms. Brodie for participating in Book Club Exchange! I think I would be nervous if I wrote a book and my friends were reading it! It took me a while to tell my friends about my blog! lol It sounds like Laura has a great book club! I would be nervous if my book club read my novel....but I think that my club is too new for me to feel that comfortable...o and I haven't finished it, let alone edited it yet. I totally get the small-town issues. My town is half the size of Laura's, and I'm sure everyone would be trying to figure out the inspiration for each character! What a great, supportive book club Laura has.